When treated with N-bromosuccinimide (NBS) and light (hν) alkyl groups adjacent to the alkenes will be converted into alkyl bromides. Under radical conditions, alkanes containing allylic hydrogens enter into allylic halogenation. A particularly good reagent for allylic bromination is N-bromosuccinimide (NBS). The bromine reacts with the alkene by radical chain mechanism. The process is initiated by light that causes dissociation of Br2 into bromine atom. Propagation of the chain involves abstraction of weakly bound allylic hydrogen by bromine atom. Throughout the process, concentrations of HBr and Br2 are kept at a minimum. 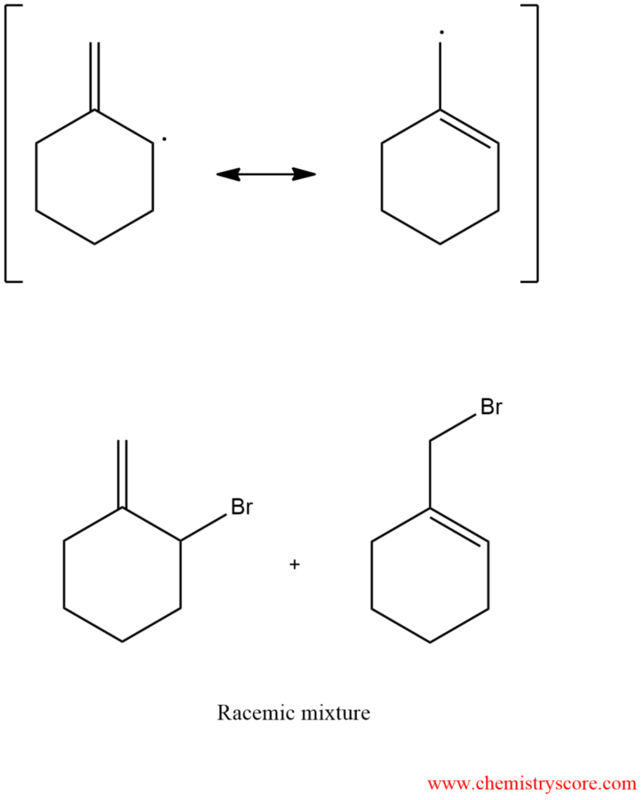 Under these conditions, the ionic addition of Br2 does not successfully compete with radical bromination. Thus, alkenes that form unsymmetric allylic radicals can give mixtures of the products upon treatment with NBS.